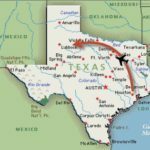 This day we were flying back to Houston. Since we needed to taste Nolan Newsom’s cooking, the day started early with Neal and Nolan arriving at the bed and breakfast to prepare for breakfast. Indeed Nolan’s breakfast was very good as we all enjoyed scrambled eggs, bacon, and biscuits and gravy. It was time to finally see Newsom Vineyards. We all piled into Neal’s truck and headed up the road. 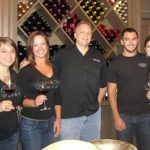 We passed by Nolan’s three acre vineyard which includes Mourvèdre and a blending grape, and then stopped at Neal’s mother’s vineyard which is ten acres. Merlot was planted near the highway and we walked into the vineyard. Neal explained all three of their vineyards, a total of 130 acres, uses buried irrigation which besides being better for irrigation, also puts any weeds in the middle of the rows making for easy retrieval. Their vines are planted four feet apart in their vineyards. All of their vineyards use a two trunk system to provide against winter damage which is their biggest issue. By having two trunks, if one gets damaged, the other trunk can still provide grapes while they start a new branch. At the rear of the vineyard were some recently planted Merlot grapes in plastic grow tubes. They also use cardboard tubes but the vines seem to do better in the plastic ones. Neal’s mother lives next to her vineyard. His father built a really nice shop next door where they do their equipment repairs and maintenance. We then stopped at his mother’s house and we were introduced to Neal’s mother and his sister Denise. After saying goodbye, we stopped at Neal’s house to pick up his wife Janice Newsom. The tour was then continued at Neal’s vineyard by pointing out Muscat vines near the house. Along the highway by the house Neal said there were about 15 different varieties in two experimental rows. 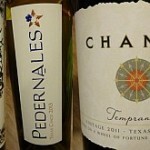 Other grapes grown beyond the road were Syrah, Cabernet Franc, Orange Muscat, and Albariño. Some wineries had their own particular blocks of rows which were marked on end posts. Janice asked what we thought about the vigor in their vineyard rows. Since we were new to growing grapes, we were constantly learning new terms. Vigor is how dense the vines are growing together. Another term learned is cordon which are the “arms” of the grapevine extending from the trunk and is where additional arms and eventually leaves and grape clusters extend. 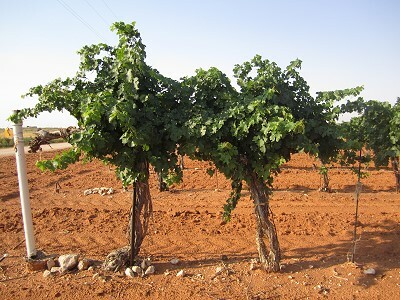 The cordons are trained along wires as part of a trellis system. The Newsoms only use two wires on their trellis system. The cordon wire is the lowest wire training the cordon while the catch wire is the highest which helps position the shoots. 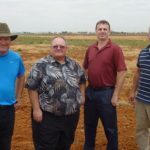 Because of their shallow, sandy, red-clay soil and being able to control the canopy through the controlled deficit irrigation, they do not need to have a more elaborate trellis system. It was pointed out how the soil is shallow where they are located. As you go further west from Brownfield which is 30 minutes to the east, the soil does get shallower on the way west to New Mexico. Newsom Vineyards also sits at 3700 feet which is 300 feet higher than Brownfield. We stopped to look at the three acres of Cabernet Sauvignon which was Neal’s first planting 26 years ago. 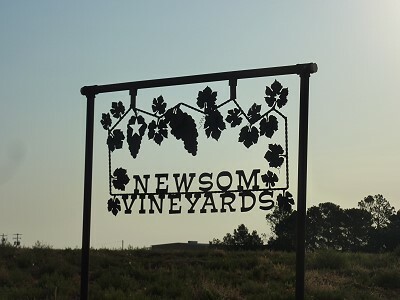 Today those vines produce about two tons per acre and even though some vineyards consider that low, those are the Newsom’s most valuable grapes and which has made their name. We continued our tour and drove by some Tempranillo. 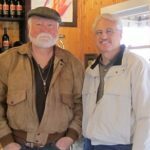 Dan Gatlin of Inwood Estates Vineyards was one of the people who talked Neal into growing Tempranillo and some of those grapes are being grown for him. 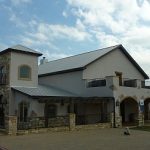 A few other wineries using Newsom Vineyards are San Martiño Winery, Bar Z Winery, and Texas Hills Vineyard. We stopped at the top of a hill which Neal called “the special effects part of his program.” The view overlooked his vineyards in different directions and a newly planted vineyard in the distance. We ended up at the “barnery.” Neal said since his mother has a barn, he couldn’t call his a barn and since it’s not a winery, they called it the barnery. 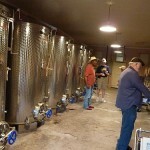 The Newsoms hold events in the barnery such as their yearly Grape Day. 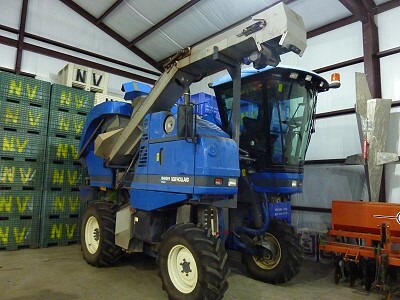 Inside he showed us a mechanical harvester and explained how it worked, along with the entire harvesting process from harvesting the grapes to the shipping of the grapes to the wineries. I also learned of Neal’s other hobbies like flying (he used to be a crop duster), restoring antiques, and astronomy. He was particularly proud of the area to honor Dr. Roy Mitchell with Mitch Lab. It was time to leave for the airport so the Newsoms dropped us off at the bed and breakfast to collect our luggage, and we promised we would definitely stop by again the next time we visited the area. 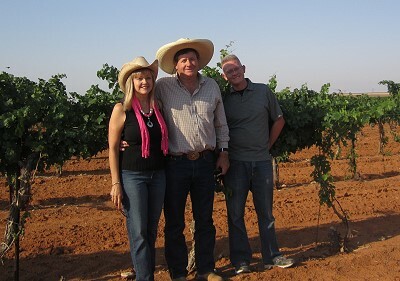 The Newsoms are a very hospitable family and even though they do not live close to Lubbock, we would highly recommend staying at their bed and breakfast and making the drive. It was the end of our four day trip to the High Plains but we had accomplished and learned a lot. Besides visiting new wineries, we also learned quite a bit about where the wines start in the vineyards of the High Plains.